A budget-friendly kitchen remodel can be in your future, says architect Mark LePage, if you plan well, shop smart—and resist temptation. Anyone with a kitchen that’s older than this century has probably entertained thoughts of a redo, although just mentally adding up the potential cash outlay may be enough to send the project straight to the back burner. But never fear: Careful shopping and creative money-saving strategies can help move a kitchen update from the to-do list to reality. As you might expect, careful shopping for the big-ticket items will yield the most significant savings. Paring ten percent or more off the cost of cabinets and appliances will leave a lot more cash in your wallet than purchasing, say, a discounted light fixture or faucet—though small savings can add up, too. To get your shopping off to a good start, step away from the professional appliances. They can be real budget-busters. The good news is that quite a few of the major home appliance manufacturers have mimicked the pro look, delivering robust styling in sleek stainless steel at steep savings. Since these appliances are designed for the home market, they may even have amenities that some pro versions lack, such as easy-care sealed-unit gas burners and self-cleaning ovens. Moving beyond appearance, keeping your lifestyle and culinary needs in mind when shopping for appliances can help save some bucks. If most of your meal preparation consists of plating takeout or heating prepared foods, a multi-burner, high-BTU cooktop or double oven will likely offer way more firepower then required. This could be a good place to scale back. Keep an eye out for appliance options and extras, and skip the ones you won’t use or don’t need. For example, a lot of refrigerators come equipped with external water dispensers—some even offer a choice of cubed or crushed ice. It’s a neat feature, but one that wouldn’t get a daily or even weekly workout in some households. Finding a model without these goodies would benefit your bottom line. 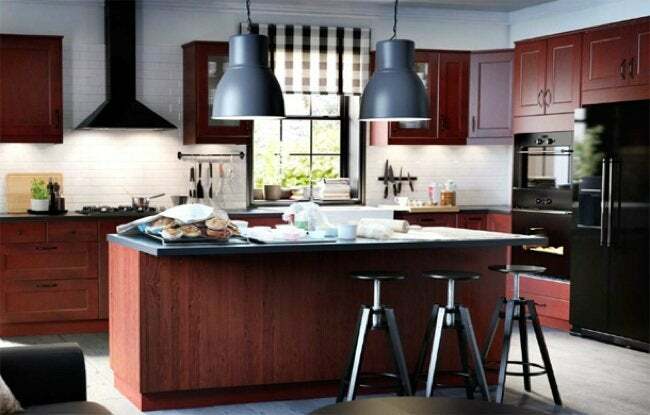 When it comes to cabinetry, home remodelers can learn a lesson from clothes-conscious fashionistas, who have always found ways of making a statement with a kind-to-the-budget blend of high and low. Just as the well dressed and the beautiful can make headlines by pairing a Gap T-shirt with a couture skirt, savvy kitchen remodelers can create a stir at home by mixing and matching items from big box stores and boutiques. Architect Mark R. LePage, AIA, president and partner in charge of operations at Fivecat Studio in Pleasantville, NY, recommends dressing up simple, budget-conscious IKEA cabinets with decorative high-end knobs and pulls. Pairing IKEA cabinet boxes with custom wood doors and drawers is another of his money-saving strategies, as is using open wooden shelving in place of the lower cabinets. LePage likes to shop at commercial kitchen supply houses for open stainless steel shelving and rolling carts, which make versatile and smart-looking storage units. Though low cost, they tend to play nicely with upscale kitchen elements. Sealed plywood cabinets are an affordable option, according to LePage. 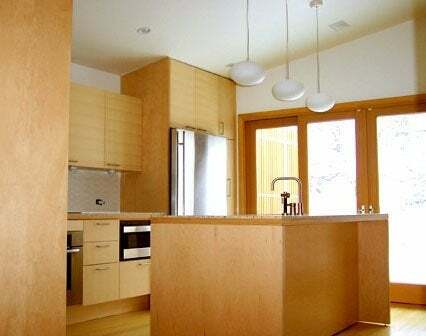 Made of wood veneer layers from trees like spruce, birch, or tropical hardwood, plywood often has a bold, distinctive grain and can be decorative as well as durable. Cabinet savings can go more than skin deep. Instead of ordering units equipped with built-in rollouts and dividers, consider retrofitting them from the array of less-expensive ready-made items available through storage specialty shops, catalogs, and big box stores. It’s also fun to improvise your own in-cabinet storage solutions: Stamp your kitchen with personal style by combining storage bins, boxes, and baskets in a mix of sizes, colors, textures and materials. Cutting cabinetry costs may make it tempting, and possible, to splurge on an extravagant countertop. Resist the temptation. There are lots of ways to get good-looking and well-functioning counters at a smart price, especially by aiming for that high-low blend. Use pricey materials such as stone or wood sparingly; focus them on specific workstations for tasks like baking or chopping. Topping the remainder of your counter space with less expensive surfaces (e.g., laminates). LePage suggests dressing up laminate countertops with wood or stainless steel edging for a custom look. He also likes to create counters by repurposing salvaged materials such as stone, stainless steel or wood. 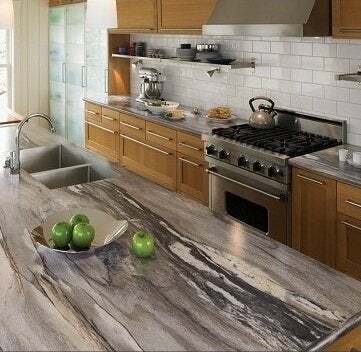 For those who love the look of natural stone like granite, marble, and even alabaster, tiles are typically more affordable than the bigger, thicker slabs that must be custom cut to fit. Ranging in size from petite mosaics to 12-inch squares to even larger rectangles, and available in a seemingly unlimited variety of colors and patterns, stone tiles are a versatile option for counters, floors, backsplashes and elsewhere. Again, there are almost endless mixing and matching options, with the luxe-looking natural stone employed sparingly as accents, borders, or to create a pattern in a surface otherwise dominated by wood, ceramic tile, or another less expensive material. The backsplash can be a place to let your imagination—and your do-it-yourself chops—run wild. Applied to the walls, sheet metal such as copper, galvanized aluminum, stainless steel or traditional tin ceiling panels can add a touch of bling to the room. LePage likes using broken colored glass for a lively and nontraditional backsplash mosaic. Or recycle your broken pottery shards, tile scraps, and other ceramic odds and ends into a pique assiette pattern, reminiscent of the playful works of the Catalan architect Antoni Gaudi. With a combination of careful shopping, imagination, flexibility and creativity, you can plan your way to an affordable new kitchen.